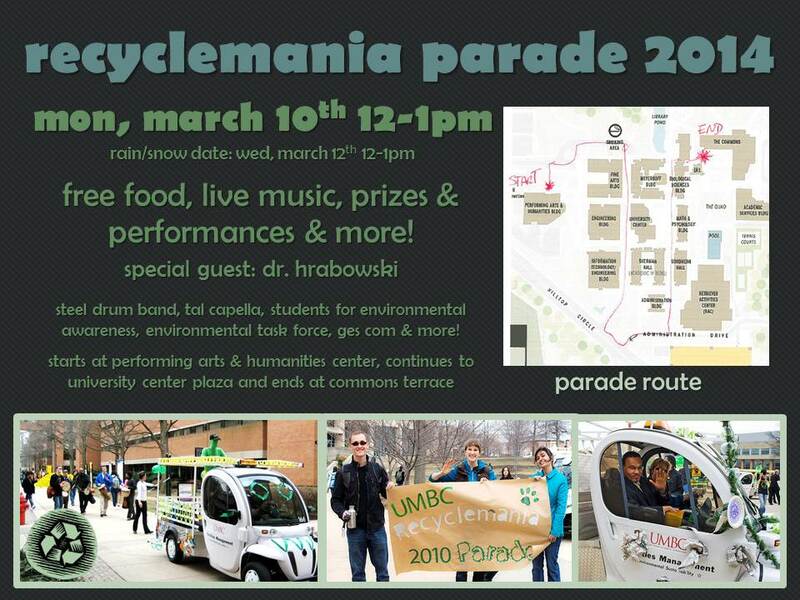 The RecycleMania Parade will be taking place on Monday, March 10, 2014 at 12PM at the Performing Arts & Humanities Center. It will continue down to the University Center Plaza with a speech from President Hrabowski and end with a celebration at the Commons Terrace. There will be Electric Vehicles floats designed by groups from across campus, food, giveaways, bikes, segways, dance and musical performances and more! The first 3 weeks of Recyclemania has reduced UMBC’s carbon emissions by 128 Metric Tons, the equivalent of taking 25 cars off the road, or the energy consumption of 11 households. Reducing, reusing and recycling protects our planet and our climate. Find out more information on myUMBC and the Sustainability Matters at UMBC website.